SOMETIMES, NO matter what you do or don�t do, you will feel like you�re out of stroke. If you haven�t hit a ball in a few weeks, you know why everything feels a little off. But even if you�re practicing as much as ever, that comfortable feeling of a fundamentally solid stroke can mysteriously disappear. If you feel like you�re arm is made out of spare parts, it�s time to simplify things. Set up a short shot that�s straight into a pocket, with the object ball a diamond from the pocket and the cue ball another diamond from the object ball. Once you can sink the ball and stop the cue ball at impact 10-15 times in a row, you�re ready to up the difficulty. Move the object ball back a diamond, and move the cue ball so it�s two or three diamonds from the object ball. Again, once you can hit this stop shot 10 times or so, you�re ready to move on. Once you feel your stroke returning to you, start experimenting with follow. Set up a shot like the one shown in Diagram 1. The cue ball�s placement on your skill level, so don�t hesitate to put it a little closer to the 1 ball. The object here is to send the cue ball off the foot rail and back up-table with straight follow. If you can do this 10 times in a row, you should start to feel pretty good. 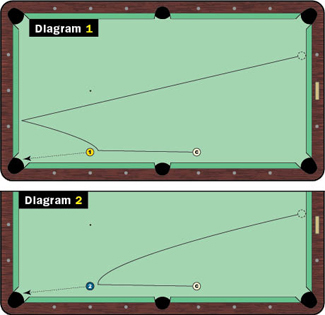 Next, try the same shot, but this time you want to use straight draw to pull the cue ball back to the head rail, like what�s in Diagram 2. To execute these shots properly, you will need to trust your stroke, so keep at it � and eventually your arm will feel like it never put the cue down.